or roam at Pay-as-you-go rates in over 200 countries. Roam in over 70 countries for $10 a day or roam at Pay-as-you-go rates in over 200 countries. Are you a Telstra Pre-Paid customer? Check the map to see the availability and pricing at your destination. Choose and activate your roaming services. $10 a day in more than 70 countries or $5 a day in New Zealand. Check the map above to see available countries. Includes unlimited talk and text. Includes 200MB of data per day to use in eligible countries. Your data expires daily, based on AEST. If you go over your 200MB, we'll add an additional 500MB for $10 for use within 31 days. Our $10 a day charge only applies when you make or receive a call, send an SMS or use mobile data in Day Pass eligible countries. If you’re travelling to a country where our International Day Pass isn’t available, you can still use your phone at pay-as-you-go rates. Available in over 200 countries. Check the map above to see Pay-as-you-go pricing and availability. Note: When roaming on a cruise, if the cruise ship turns on their satellite service, your mobile device will connect to the strongest signal which in many cases is the cruise service. If this is the case, you will be roaming at Pay-as-you-go rates, even if the nearest country is eligible for Day Pass. If you activate Pay-as-you-go roaming and enable Day Pass, we will automatically activate a Day Pass when you use your mobile service in eligible countries. If you use your mobile service in countries that are not eligible for Day Pass, you will automatically roam at Pay-as-you-go rates. Set up Day Pass and Pay-as-you-go roaming and enjoy staying connected whilst you’re away, hassle free. Looking for international roaming for Small Business customers? Looking for international roaming for Pre-Paid customers? or select a destination from the map below. Note: Network types and frequencies vary by carrier and country. Contact us on live chat to check compatibility with your device. How does International Roaming work on a cruise? When roaming on a cruise, if the cruise ship turns on their satellite service, your mobile device will connect to the strongest signal which in many cases is the cruise service. If this is the case, you will be roaming at Pay-as-you-go rates, even if the nearest country is eligible for Day Pass. Will I be notified of charges when on a cruise? Yes, as soon as your mobile connects to the cruise ships satellite you will be notified that you are now being charged PAYG rates. How do I activate my international roaming as a Pre-Paid customer? If you’re a Pre-Paid customer, international roaming should already be enabled on your service. If you’ve disabled it, you can contact us to switch it back on. Head to the Pre-Paid international roaming page to find out more. How can I reduce my phone bill while I’m overseas? Try to use Wi-Fi wherever you can. Free Wi-Fi is available at Telstra Air® Fon Spots in over 80 countries – just activate Telstra Air before you leave Australia. You can also cancel MessageBank® before your trip so you’re not charged to listen to your messages. While you’re overseas, your voice messages will be converted to texts and sent to you. For more tips, visit our help and support page. Do I need to switch off international roaming when I return home? No. You can leave international roaming on in Australia as it only comes into effect while traveling overseas in eligible countries. I’m having trouble with international roaming. What should I do? If you’re experiencing issues with international roaming, try our international roaming troubleshooting tips. And if you still need help, you can always contact us. 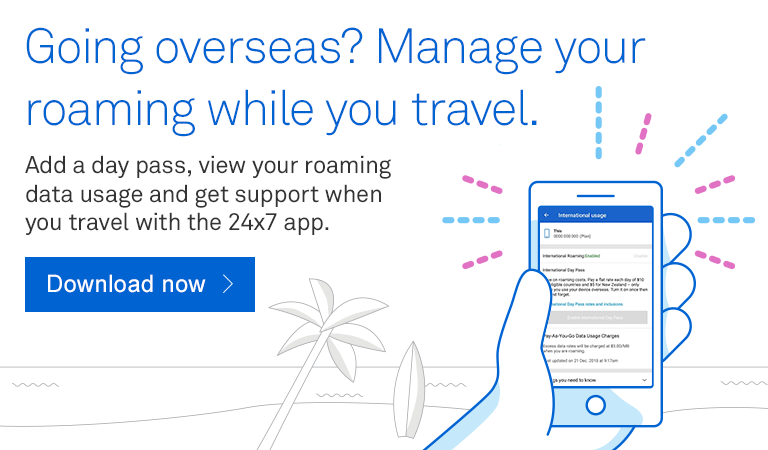 Got questions about International Roaming? If you’ve got questions, there’s a good chance we’ve covered them with our FAQs. Call us anytime on +61 439 125 109 for technical or roaming support while overseas. All calls are toll free if made from a Telstra service. Need to talk to someone? We can help. Chat with us now. Activate an International Day Pass OR pay-as-you-go rates. Argentina, Austria, Bangladesh, Belarus, Belgium, Brazil, Brunei, Bulgaria, Cambodia, Canada, Chile, China, Colombia, Croatia, Cyprus, Czech Republic, Denmark, Ecuador, Egypt, Estonia, Fiji, Finland, France, Germany, Greece, Guatemala, Hong Kong, Hungary, India, Indonesia, Ireland, Israel, Italy, Japan, Laos, Latvia, Lithuania, Luxembourg, Macao, Macau, Macedonia, Malaysia, Mexico, Nauru, Netherlands, Norway, Papua New Guinea, Philippines, Poland, Portugal, Qatar, Romania, Russia, Saudi Arabia, Serbia, Singapore, Slovakia, Slovenia, Solomon Islands, South Africa, South Korea, Spain, Sri Lanka, Sweden, Switzerland, Taiwan, Thailand, Turkey, UAE, UK, Ukraine, USA, Uruguay, Vanuatu, Vietnam. 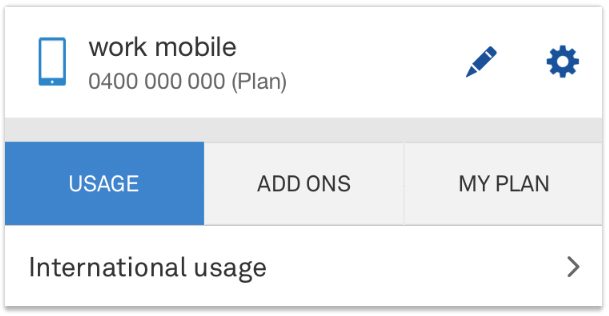 It's free to use the My Plan Manager, Telstra 24x7 App and My Account on the Telstra mobile network within Australia, although some functions might use a small amount of data. Unlimited calls and SMS is only available to mobile handset plans to and from standard numbers while in an eligible country. It excludes premium, directory assist and satellite numbers. Some usage is excluded from International Day Pass such as MMS, video calls, third-party content charges, calls and SMS to premium numbers, satellite numbers and operator-assisted calls. These are charged at standard international roaming rates. Cruise ships utilise satellite services rather than a mobile network. Therefore talk, SMS and data usage made on cruise ships won’t be covered by our Day Pass. We recommend contacting your cruise ship or travel provider to see their on-board arrangements. International Day Pass inclusions based on Australian Eastern Standard Time. Any unused data expires at the end of each day. If you go over your 200MB daily data allowance, we’ll automatically add a $10 Data Top-Up with 500MB, valid for 31 days from when it was added. International roaming can be deactivated at any given time by using any of our self-care tools. If you’re overseas, you can contact us by calling +61 439 125 109. All calls are toll free if made from a Telstra service. Call forwarding restrictions: From 12 May 2015 call restrictions apply for our call forwarding service. Calls can only be forwarded to Australian numbers. This helps us protect you from any fraud in case your phone is stolen while you’re overseas. Select the mobile service for which you want to turn Pay-as-you-go roaming on. Activate Pay-as-you-go Roaming by clicking Activate under International Roaming. Download the Telstra 24x7 App. Select the mobile service for which you want to activate Pay-as-you-go roaming. Tap International usage to open options. Tap Enable for International Roaming only. Tap Confirm to enable International Roaming. We will send an SMS to your mobile once it is enabled. International Roaming will be enabled within 15 mins but can take up to 2 hours. Don't forget to check that data roaming is turned on in your device settings. Save on roaming costs when you enable International Day Pass. Only pay for days when you use you device overseas. Select the mobile service for which you want to enable International Day Pass. Activate International Day Pass by clicking Enable under International Day Pass. Tap Enable International Day Pass. Tap Confirm to enable International Day Pass. We will send an SMS to your mobile once it is enabled. 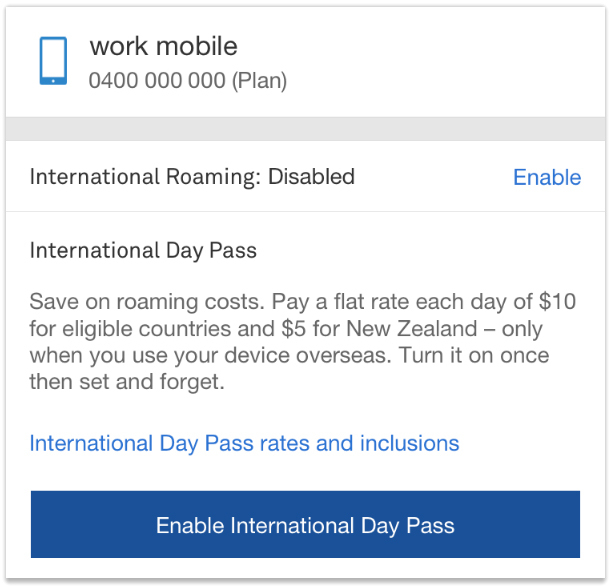 Enabling International Day Pass also enables International Roaming. International Day Pass will be enabled in 15 minutes but can take up to 2 hours. Don't forget to check that data roaming is turned on in your device settings.